KANSAS CITY, MO. — The final, low tones of Carter Pann's Symphony for Winds: "My Brother's Brain" captivated the audience in Helzberg Hall, hanging in the air for several moments. Under the baton of its conductor, Dr. Mallory Thompson, the Northwestern University Symphonic Wind Ensemble then gently brought the penultimate concert of the College Band Directors National Association's 2017 conference to an emotional close. 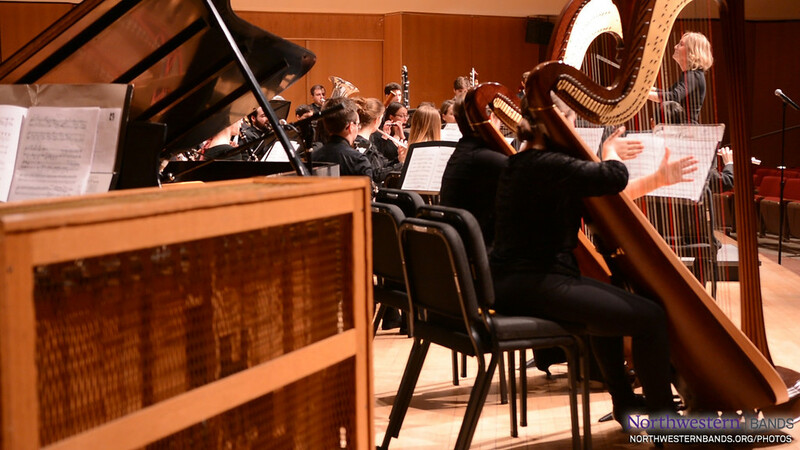 "We are deeply honored to take the Symphonic Wind Ensemble on the road to share our concert program with the CBDNA community," says Andy Hudson, a second-year doctoral graduate clarinet student at Northwestern's Bienen School of Music. In addition to Pann's symphonic tribute to his younger brother and Richard Strauss' Festmusik der Stadt Wien, the program included that secret from the river. That work, by Joel Puckett, was commissioned last year on the occasion of the opening of the Bienen School's new Patrick G. and Shirley W. Ryan Center for the Musical Arts in Evanston, Ill.
"Getting ready for this concert has been a joy for the ensemble," says Hudson, "and has pushed us to new heights of artistic expression." Being selected to play for the CBDNA National Convention is one of the more prestigious honors for collegeiate wind ensembles and their conductors. The convention happens only biennially and only a very select number of groups are accepted to perform. Just nine other university bands — all among the finest in the nation — were selected to perform this weekend. Each was chosen by a panel of collegiate conductors in a blind audition-review to present National Conference concerts at Kauffman Center's 1,600-seat Helzberg Hall, which is home to the Kansas City Ballet, Lyric Opera, and Kansas City Symphony. This concert marks the Symphonic Wind Ensemble’s fourth CBDNA appearance. Hudson, who previously earned a master of music degree in 2012 from Northwestern, says he felt compelled to return to the university to pursue doctoral studies and perform again with the Symphonic Wind Ensemble. "SWE is the rare group that operates to professional standards but feels like a family, and the opportunity to share what we do with the CBDNA community is an honor," he says. "Dr. Thompson has crafted a program that highlights much of what makes Northwestern a unique and special place to make music." The Symphonic Wind Ensemble’s current membership includes students from 21 states and four countries. The ensemble was founded as the University Chamber Band in 1954, when director of bands John P. Paynter began experimenting with flexible instrumentation in a single-player-per-part configuration. Renamed the Symphonic Wind Ensemble in 1969, the group began developing a reputation for innovation and artistic performance, honoring and expressing the orchestral training and tradition of Northwestern’s applied faculty. Thompson is Northwestern's current director of bands and John W. Beattie Chair of Music at the Bienen School, where she also coordinates the conducting program.